This weekend, we found the excuse that we were “looking for”. As part of our “what was that noise?” investigation, we scoped the cylinders and pulled the valve cover. I was half-expecting to see maybe a partially-broken valve spring or something. No such (bad) luck. Truth is, we didn’t find anything catastrophic that calls for engine rebuild/replacement. But we did find one thing that’s going to be an engine-out procedure. 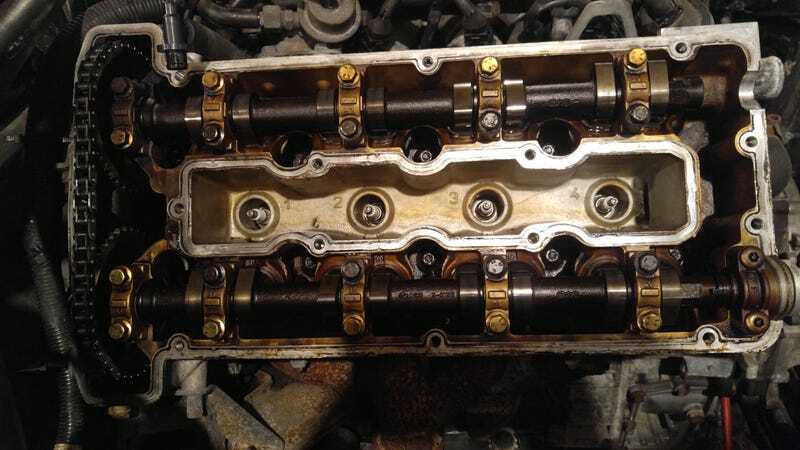 Now, there’s a clever trick to replacing the chain that involves pulling the valve cover, and splicing the new chain into the old one before turning the engine to feed the new chain through before removing the old one and reconnecting the new one’s master link. But that technique doesn’t give us access to the guides, so we’re not doing that. What we’re doing is pulling the timing cover, which apparently means pulling the engine. What is this, an Audi? No, it’s a Saab, which also means that the gearbox, bolted to the bottom of the engine instead of behind or next to it, is coming out too. Now I really wish we hadn’t spent so much time busting knuckles against the firewall to replace the drive belts and oil pump seals. But so long as the engine has to be pulled, we might as well take the opportunity to do a bunch of other preventative maintenance items in order to avoid pulling the engine or transmission again for a LONG time. Since the timing chain is getting changed anyway... why not dig just a little further and throw a new head gasket on before installing the new chain? At 132,000 miles, it might not be a bad idea to change the water pump while we’re at it. Might as well refresh the engine-to-gearbox “oil pan” gasket too, before it starts leaking. It’s already drained of oil and coolant, so we’re already part-way there. The more I think about it, the more this worn guide seems to explain everything. The initial “shattering” noise that quickly went away could very well have been bits of guide material falling down. And the subsequent “rattling” that seemed to get worse as the engine warmed up may have actually been timing chain slap. Of course, this will add a significant delay towards getting this car on the road again, but I think it’s worth it. Good thing we exposed a weak point before he started driving it around; this’ll give us a good excuse to freshen some other things up instead of crossing our fingers and hoping that the old gaskets continue to hold up.